Lexi is a happy quiet pug that is OK with other dogs or on her own. The only proviso is that she needs human company 24/7 as she gets separation distressed, though with another dog as company she can be left for a few hours. A nervous dog but is getting more confident by the day, we currently have 6 dogs and at first she wasn’t too socialised with dogs but is now a lot more comfortable. Bad habits loves human food and will bark for it, we have never fed her human food so she is barking less but it will take some determination to stop her begging at the table, though she is learning. Hi I’m interested in rescuing a pug puppy for my autistic daughter who is 10. The reason we would like a puppy or young pug is so she can name it herself. I would be grateful of any further information. I have a black and tan brindle pug named Stella who is three years old and would love some company. She is excellent with other animals of all sorts. I have been obsessed with pugs since I can remember and it would be my dream to take Lexi into my home. I’ve seen your adoption advert for Lexi. I have a home ready for Lexi, should you decided I’m the right person to be her new mummy! I’m a 22-year-old living with my parents and fiancé, we have 2 other friendly small dogs who would keep her company and of course, keep her well loved too! I’ve wanted an addition to our little family for some time. We have a large chalet bungalow, with a good sized (contained) back garden for her to run around in, to her heart’s content along with a cozy little space at the end of our bed where she can sleep. I work from home so she will always have company and there are 7 of us in the house when full so lots of love and cuddles! Hi can you tell me if Lexi is still available? We would love to adopt a pug and Lexi seems perfect. I am a disabled lady in my late 50s. I am home all day every day. I have several cats, but they are Burmese and Australian Mists so great with other animals. If she is still available please would you contact me. I am in Eastleigh, Hampshire. We would like to come and visit lexi with the view to welcoming her go her new forever home, we currently have a 5 year old pug cross called Prince who is neutered and would love a companion to keep company in the mornings and afternoon whilst my wife is on the school run. Please let me know an ideal time to come and visit her and I’ll make the arrangements to be there. Hi, is she still available? I’m disabled and unable to work so am in the house all the time. I also have 2 other dogs who would be fab company for her!! Hello, been looking for a pug. As so many people don’t want them or get rid of them. I think think they are amazing, beautiful animals. I have a bull massif. Which we rescued from a home he was badly beaten and now he’s with our lovely family who cares and looks after him 24/7 he loves attention and gets so much of it bless him. We would love for him to have a little friend as he is afraid of bigger dogs and he loves a smaller dog he can cuddle up to and play around in the garden and lexi seems like a perfect match. Hi, I would be interested in getting Lexi and I just wanted to find out how much she is and if she requires any vaccinations. My wife and I are wondering if these two lovely pugs are still available? Hi I am at home and able to have Lexi with me at all times because I am unable to work due to poor health but I am able to look after her. I have a wonderful Chihuahua who I think would get on really well with Lexi, he is neutered. Is Lexi still available? Please contact me if you think that she would be a good fit for our family. Thank you. Hello! i have been wanting a pug for a long time and i was wondering how much is!! LEXI is adorable. Just wondering is she is still available? Probably not now. We have two elderly house cats so she would need to cope with them but otherwise, either myself or my girlfriend would be with her 24/7. No children, nice calm household. Hi is lexi still available for rehoming? I have to make pugs one is 6 and one is 5. Me and my partner work different shifts so there is always someone home with them, when we go out they come with us. Hi. Is Lexi still looking for a home? We have another small dog ( a yorkie) and I work from home. We have a large walled garden and plenty of love and patience to give as a family. Hi. I would like to know more about Lexi. We have a 2 year old pug,healthy and as happy as he could be. We want a friend for him. I work 3 days par time, but we are 3 family member and one of us is at home. We have a yard, and we never considered to move in a flat. Please email me. Hi there, lexi looks absolutely adorable. I’m home 24/7 so she will have lots of company and always around for cuddles, would love to know if she’s still looking for a home. Hi, i would love to know if Lexi is still avaliable. My son is going through a long term relationship breakup and has always wanted a black pug but has never been able to keep one due to his ex girlfriends dogs. Now that he is in the position to get a pug we would love to surprise him with Lexi. 6 people live in our house so there will always be someone in the house to give full attention to Lexi and we also have another dog called Gary who will be able to keep her company too. Please let me know, thank you . 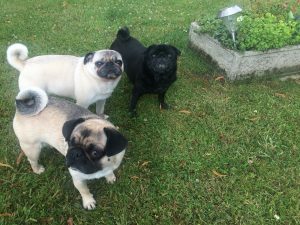 Hi, we recently lost one of our pugs and now feel it would be a good time to get a friend for our other dog. She is very easy going and would accept another friend. I am retired and so am at home 24/7. Aggie is never left for more than an hour at a time perhaps once a fortnight. If you think our household would be suitable for her then please contact me for further details. Thanks for considering her after our phone call and your emails we understand circumstances means she is not right for you. Hi just wondering if Lexi is available please?.i work from home 24/7 i live alone so Lexi would have all my attention all the time. 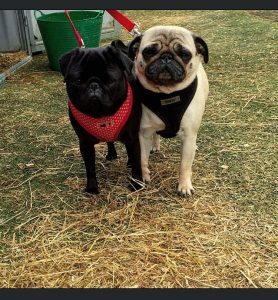 I absolutely love pugs know all about the breed ,and could give Lexi a lot of love and 100 per cent attention .i live near a beach and countryside so can take her on lovely puggie walks but carry her home when she’s had enough of walking!! !